Stemming from a strong bond between two sisters, the multi accessory brand Marion Godart was named after one of the siblings. The other one is called Martine Manardo, and she’s the one by whom everything started. “My sister has always liked antiquing and working with her hands. After the May 68 events, she decided to launch her own jewelry line under the brand name Rohanne”, recalls Marion who offered her logistics contribution during that time, while dedicating herself to her studies and to the preparation of her Italian doctorate. More cut out for creation than teaching, in 1988 she decided to team up with her sister. The very same year led to the birth of what was to become a real family success story. Eighteen years later, the Marion Godart label radiates from 850 points of sale around the world. Its first aficionados remain Italians, then Greeks, English, Japanese and Spaniards, these markets account for 60% of the activity. In France, the brand is distributed in department stores, Printemps and Galeries Lafayette, as well as in multi accessory, ready to wear and fantasy jewelry boutiques. 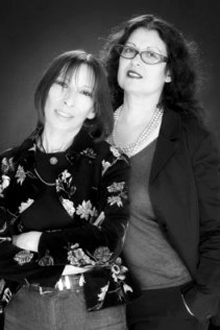 Their palette of articles is wide: “At the outset, my sister designed jewelry. When I arrived, with a passion for sewing and making my own clothes, I immediately developed the textile aspect, and opened up the field of creation towards other accessories such as scarves, fur pieces but also hats, gloves, some decorative pieces and mostly bags which now represent our core target, almost equally with jewelry”, she adds. Their style? Marion defines her sister as a creative buff, admiring the Art Nouveau and Art Deco trends from which she draws her first inspirations. But the specificity of the brand resides in its wealth of natural materials (wood, horn, shell, hard stones, mother-of-pearl) all with heavy volumes. Resin has recently also appeared in jewelry and leather dominates the composition of bags.Nursed between two cultures (a Tunisian mother, an Italian father), the two sisters set forth a chic ethnic trend in a number of collections, with colour as the main asset.